"Having secured a site (in 1858), the Council offered premiums for the two best designs for chapels, and for laying out the grounds. No less than sixty-five architects, residing in various parts of the country competed, and several designs for the arrangement of the grounds were also sent in. 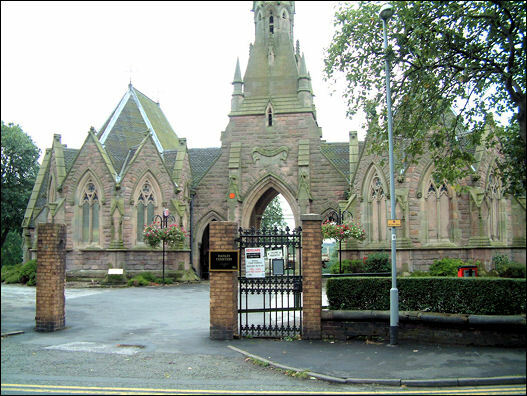 The designs of these gentlemen were publicly exhibited at the Town Hall, and ultimately that of Messrs. Ward and Son, architects of Hanley, for the chapels and lodges ..... was accepted." In the early 1850's a number of prominent inhabitants in Hanley proposed that the authority should provide a public park. Others, most notably, John Ridgway, pottery manufacturer, of Cauldon Place, Shelton, opposed the proposal to build a park arguing that a public cemetery was more urgent. 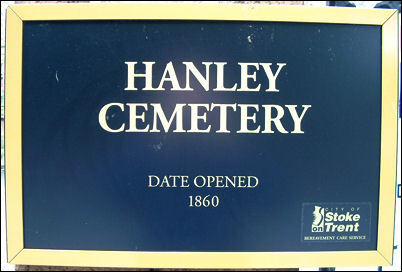 When Hanley was incorporated in 1857 Ridgway was elected the first mayor of the borough of Hanley and was instrumental in the setting up of a Burial Board Committee in October 1857. Consequently the cemetery was opened in 1860 and Hanley Park was not opened until 1897.